After I first saw a Tape Rescue on Pinterest, I was inspired to replicate the idea straight away. What is a Tape Rescue? 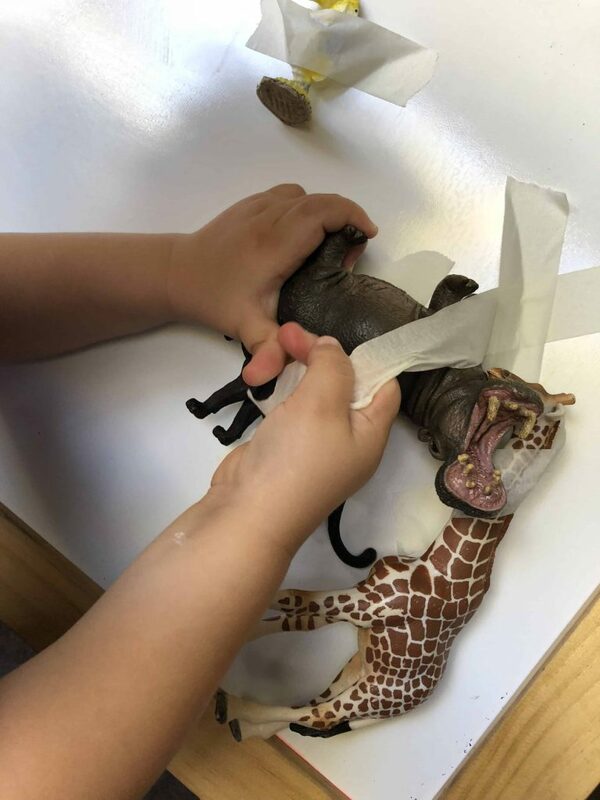 A Tape Rescue is a fun fine motor activity for toddlers and preschoolers that involves taping a toy to a surface and then giving the child the task off pealing the tape away to ‘save’ their little victim. Over the last year, we have performed many a rescue. 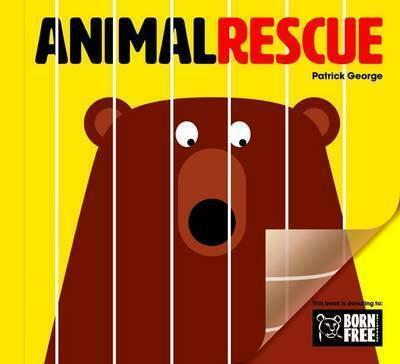 We have rescued bugs, zoo animals and dinosaurs. We have rescued them from the confines of egg cartons, baking trays and the top of our play table. 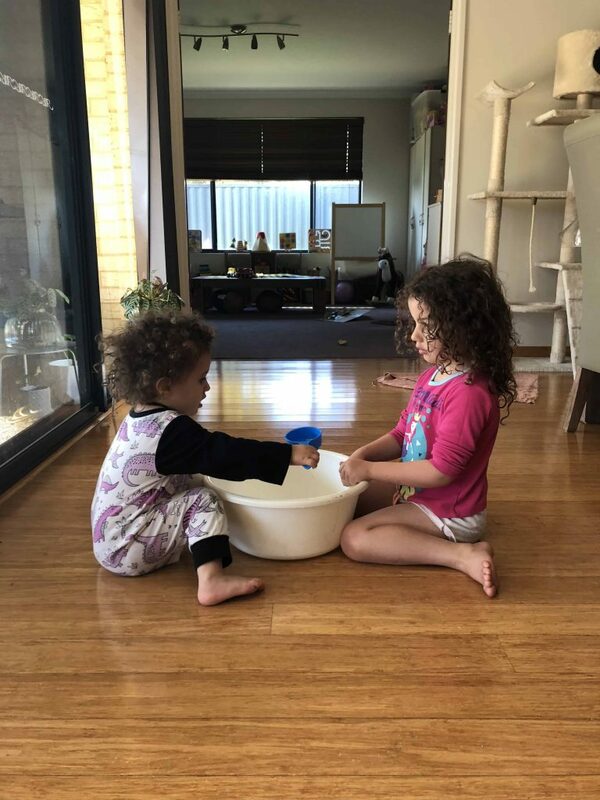 Saving their little friends has always been an activity that both Miss 4 and Miss 23 months have enjoyed. 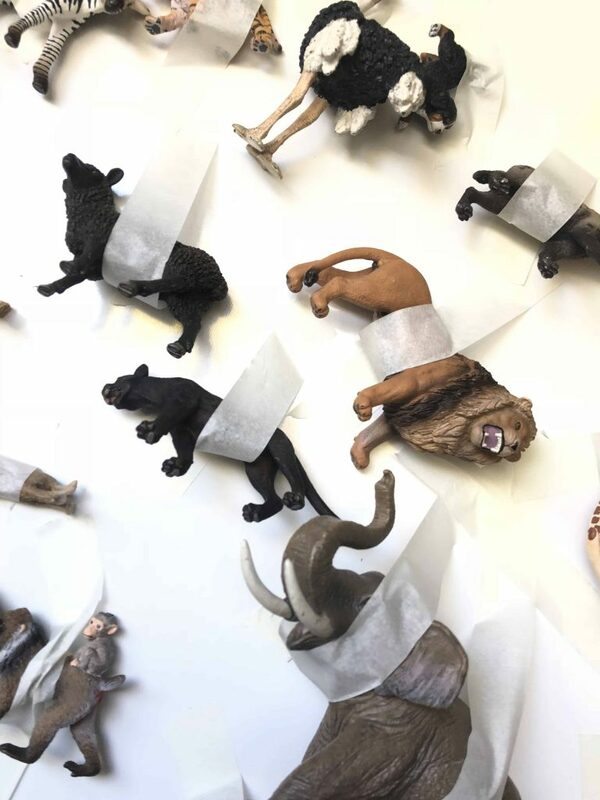 Picking the corner of the masking tape to reveal an edge and then grasping the end to tear their toys free has been a saving grace for many a witching hours. It was just the other day that I was encouraging Miss 23m to reach as high as she could to draw on her easel that the idea came to me. What difference would a vertical challenge make? 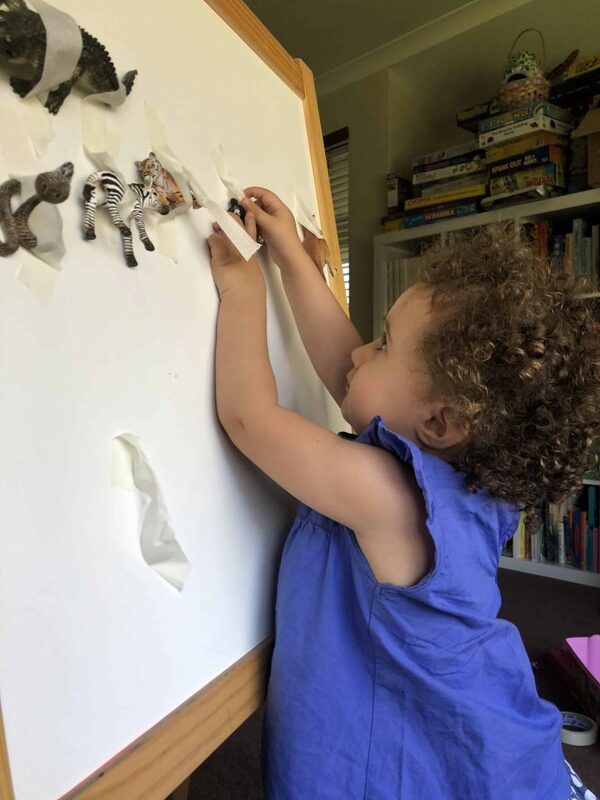 Working on vertical surfaces is a great means of building up all important gross motor skills. That is strengthening the larger muscles groups (in this case) of the arms. Does it surprise you to learn that well developed gross motor skills can have a positive impact on more refined tasks such as tying shoe laces and doing up buttons? 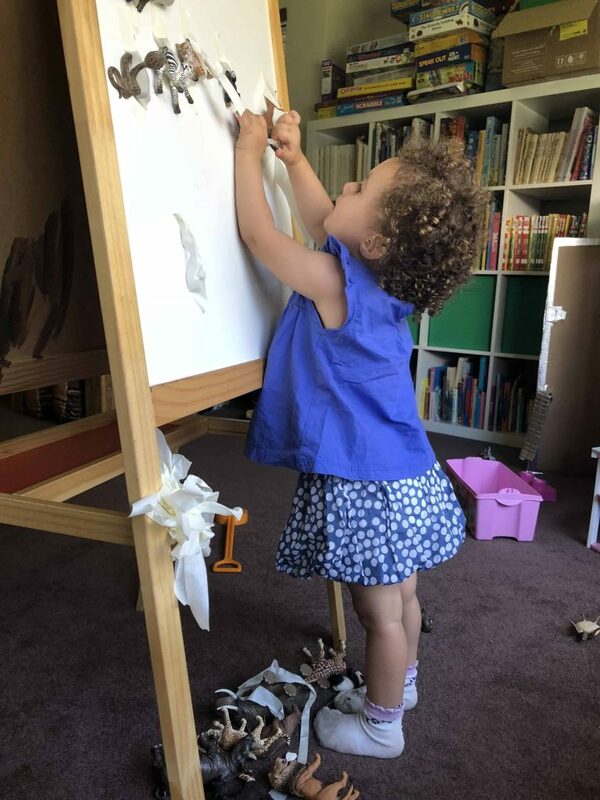 When operating on a vertical surface, you will find that your child will use larger motions of the arms instead of small motions of the hand and wrist. 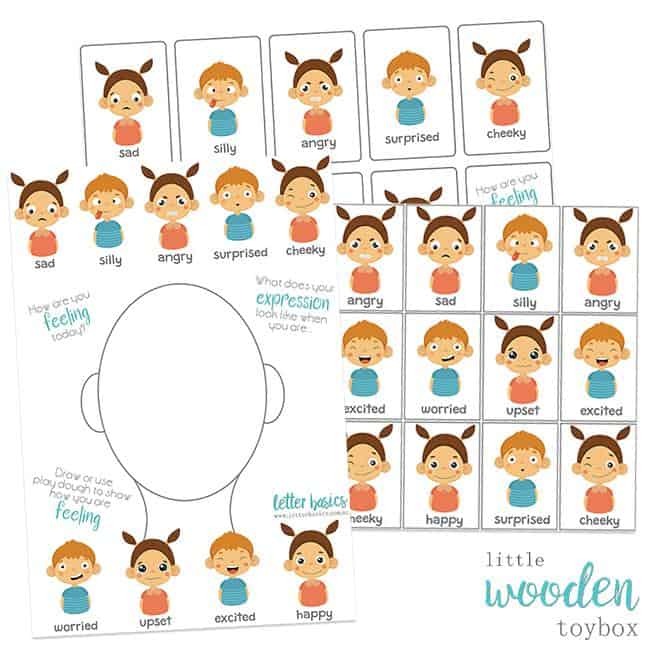 There are so many variations to this activity that may be created to suit what resources you have at home and your child’s interests. 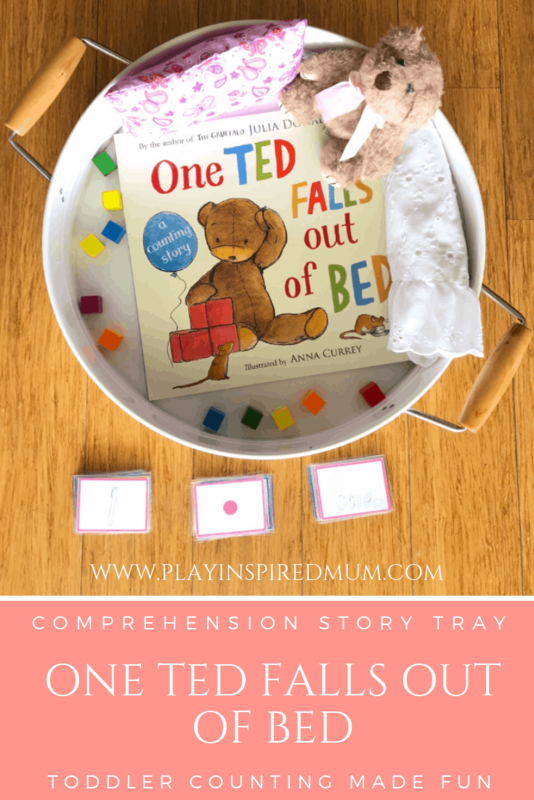 We used an easel (from Ikea) to create our version of this activity but if you don’t have one, don’t stress! Any vertical surface would work! While considering which surface to use, please just keep in mind the tape that are using and how it may react with your selected surface… we use a painters masking tape (from Bunnings). So far we have been lucky to not have discovered any finishes that it may ruin but that doesn’t mean you shouldn’t check first! Once you have selected your surface, all you need to do is secure some toys to it with your tape. Choosing your toys is very important. Keeping in mind that if a child is not interested in an activity, they really aren’t going to gain as much from completing it as much as if the task had their full attention and they were interested. Play to your child’s interests. If they love trains, use trains. If they love ocean life, set up this activity using they ocean figurines. 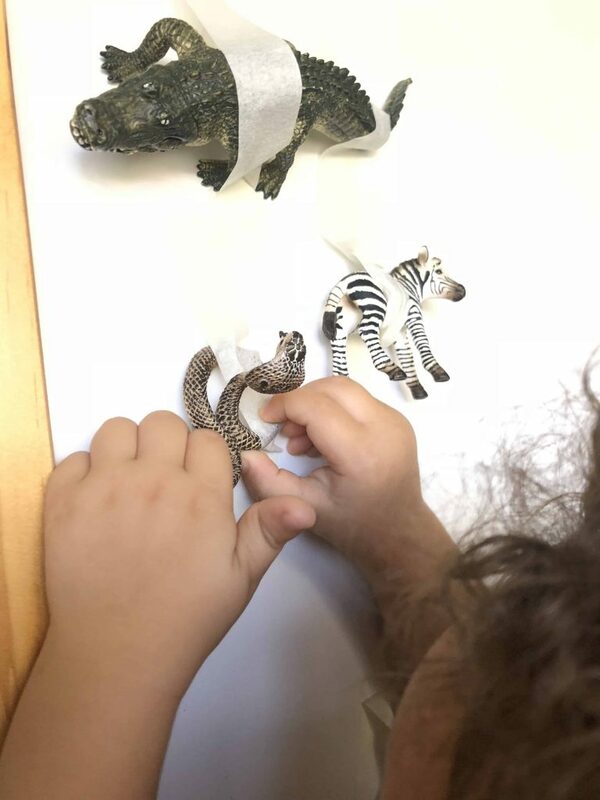 Does your child love dinosaurs? Tape those dino’s all over the place! Im a huge fan of exploiting my children’s passions to engage them in their activities! How to Play with a Tape Rescue? 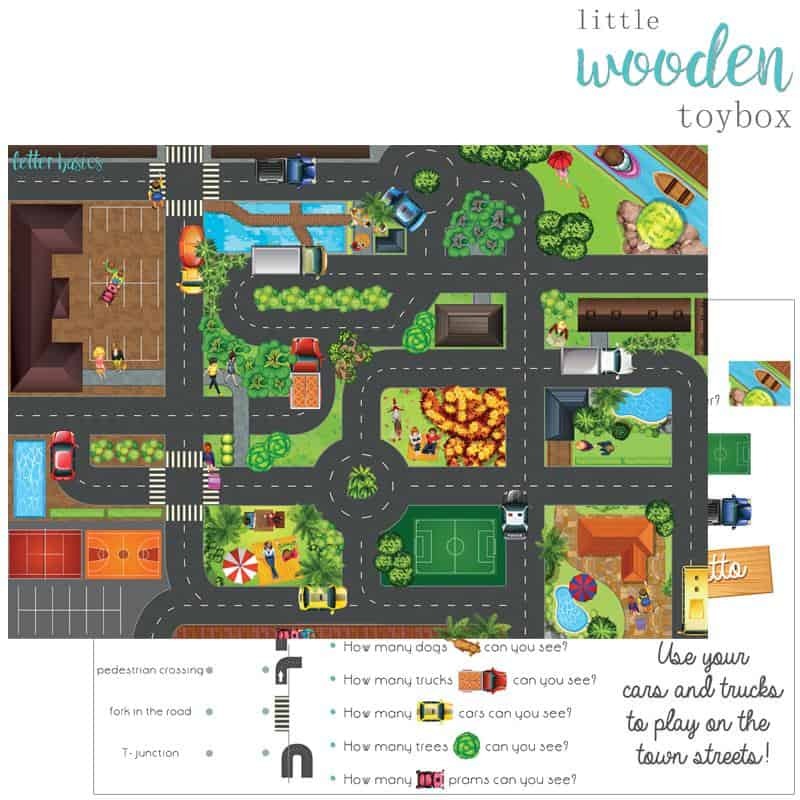 Introducing this activity to your child, you may be tempted to explain to them ‘what to do’. Here is another something that you may like to consider instead… why not ask them what they think they need to do? Every child will have a unique perception and reasoning behind the answer to this question. It will challenge them slightly, the answer will need to be thought out, they will need to assess what is in front of them with more detail rather than simply complying to our instructions. How does the tape feel? How would this toys get stuck if it were real? What part of this activity do you find the most difficult? Which part of this activity are you best at? How long do you think it will take you to complete this activity? How do you think you would feel if your were stuck? What are some occupations that may need to rescue people? 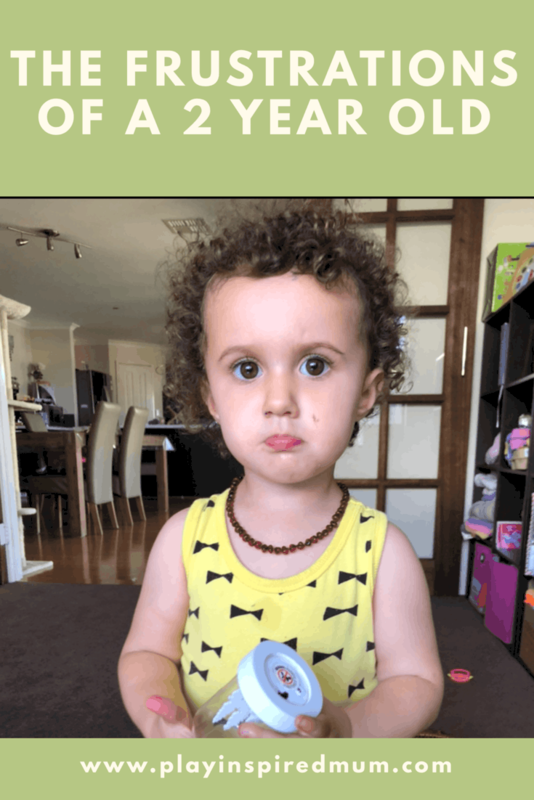 These open ended questions will encourage your child to think outside of what they are doing directly, pull their attention to the finer details, build their vocabulary and comprehension and encourage them to communicate their own ideas and opinions. 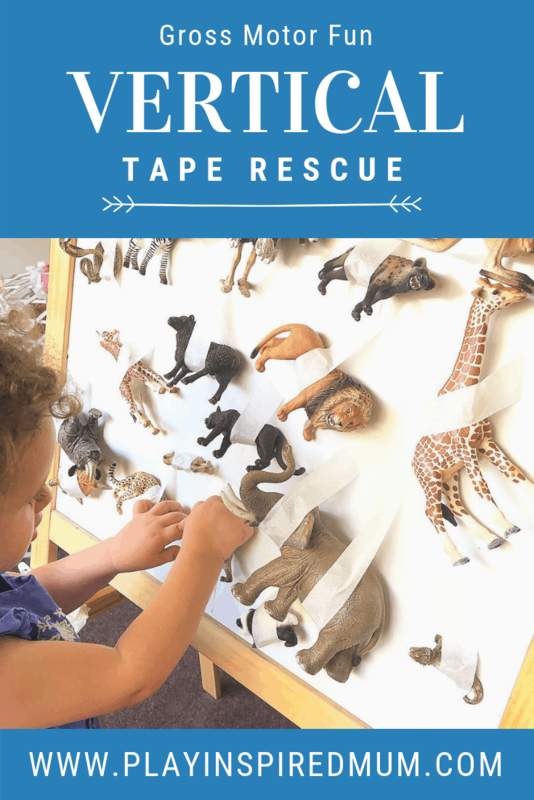 What educational attributes does this Vertical Tape Rescue offer? Lifting their hands above their head involves using those large muscles groups in the arms, shoulders and upper back. These larger movements will help increase muscles tone and flexibility – all while saving their favourite toys! This really is a winner activity. 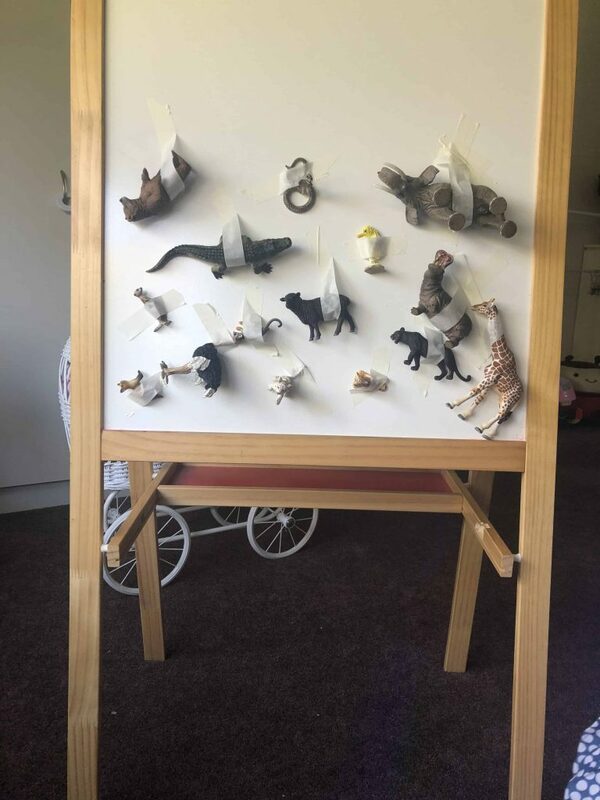 Why not have your child stick the toys to their surface of choice them self? There are so many variations to this activity. Keen to share yours? We would love to see it! 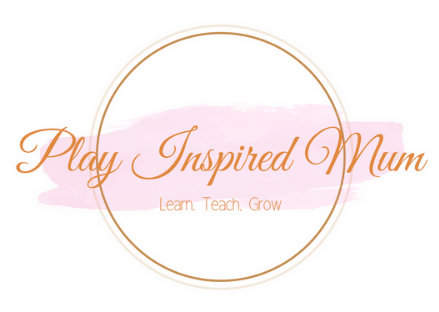 Please feel welcome to join our Play Inspired Mum Facebook Group and share your interpretation to this fun activity! Are you looking for other activities that can be completed on a vertical surface? Check out these educational learning resources! 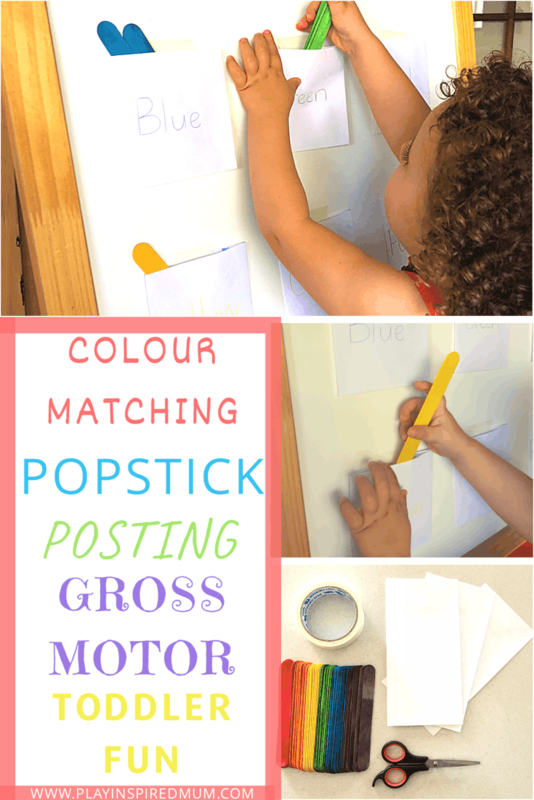 Tape them to a door or wall and make gross motor fun! 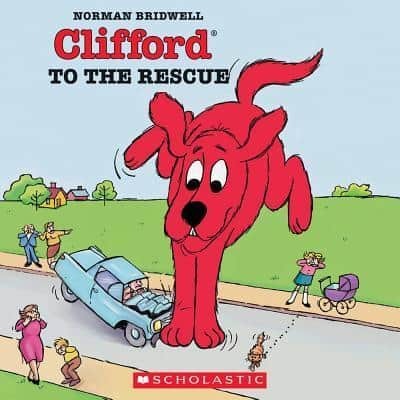 Carry on with the Rescue theme with these great children’s books! Love this vertical activity? Why not try exploring colours!